To ensure you have a pleasant, well-organised stay at the Air Show, here is some information on the facilities and services designated for visitors with disabilities. There are dedicated routes to help you get on and off Base depicted by the nationally recognised, ‘wheelchair’ symbol on traffic signs as you approach Cosford. When approaching RAF Cosford, please clearly display your Blue Badge in the windscreen so our traffic marshals will direct you to the correct route. Where possible, we aim to make all Air Show attractions easily accessible. However, please remember that the airfield is a green field site and some of the ground may be uneven. The Air Show site is well served with mobile toilets that have accessible facilities. Exact locations are highlighted on the Air Show map depicted within the Souvenir Programme which is available for purchase on the day. Assistance dogs are welcome within the Air Show but please be aware that there will be an increased level of aircraft noise throughout the day. Please note that no other animals are allowed on to the Air Show site. 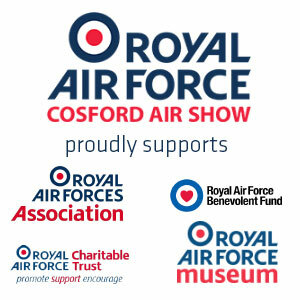 Event Mobility provides electric scooters and manual wheelchairs for the use of our disabled, elderly and mobility impaired visitors to the RAF Cosford Air Show. For further enquiries, please contact Event Mobility directly. All proceeds go to Event Mobility. Please be aware that advance bookings cannot be made by phone and that this facility often becomes fully booked before the Event. Event Mobility vehicles will only be available for collection from the Disabled Car Park, which is a significant distance from the entrance point for visitors travelling by train or coach. Please note at Cosford Railway Station, access is restricted by steps. Travelling to the Air Show in a taxi or any service where you expect to be dropped off is not advised as the roads into the show become a one-way system. The nearest drop-off location is nearly 1 mile from the pedestrian entrance to the Air Show, so we recommend you use an alternative means of travel.